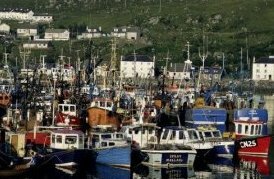 Fishing fleet in harbour, Mallaig, West Coast, Highlands, Scotland. 10x8 Photograph (25x20cm) Fishing fleet in harbour from Robert Harding . Mallaig is a port in Lochaber, on the west coast of the Highlands of Scotland. The local railway station, Mallaig, is the terminus of the West Highland railway line, and the town is linked to Fort William by the A830 road, known as the "Road to the Isles".